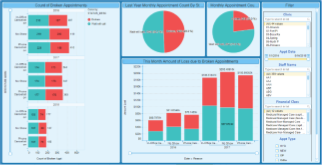 Gi-Dental Practice Analytics solution provides advanced analytics solutions for Dental Service Organizations and Multi-Clinic Practices using the power of TIBCO Spotfire®. Track your practice’s core financial and operational metrics across clinics and departments. Proactively manage procedures and providers. Track core patient metrics, demographics, tendencies, and referrals. Compare year on year financial reports for accurate predictive modeling. Gi-Dental provides your practice with the boost it needs to enable faster decision making through more in-depth data analysis. Advanced visual analytics are built with TIBCO Spotfire® using your EHR data. Robust interactive dashboards give you the capabilities to easily and efficiently analyze your data, and make informed fact-based decisions. Compare generated revenue to budgeted revenue and view forecasted revenue based on captured year-to-date data. Compare revenue across locations to previous years or to competitors. Outstanding collections can be analyzed by age and information adjustments, aging (both guarantor and insurance), and accounts receivable analysis enables you to plan and manage your operation’s financials to the best of your ability ensuring you stay alert to key financial indicators within the operation. Easily track patient activity and practice growth. You have the ability to view your customer demographics in multiple visual formats such as map charts or trend graphs, then drill through to procedures data to understand what activities were performed. Categories such as age, gender, county, zip code or other demographic indicators allow you to analyze clinic performance and procedural requirements. Analyze your referral data and identify a new target market. Identify trends and peak periods, thereby allowing for alternative marketing techniques to increase visits during off-peak periods. Analyze insurance carriers billing cycles, and compare it to procedures and cost coverage. Identify which insurances cover popular procedures within your clinics. 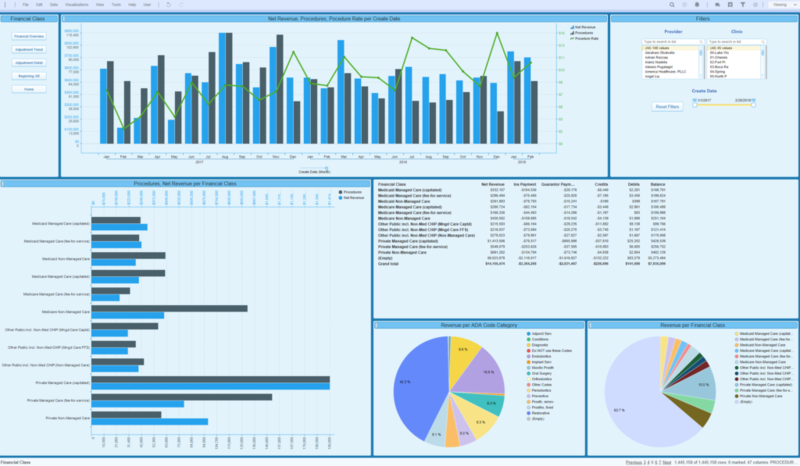 TIBCO Spotfire® licenses are included allowing the full flexibility to visually analyze your data as you like to see it. Enhance the existing content and add additional data from your financials or surgical systems. Gi-Dental allows you to leverage leading edge technologies to manage your organization. Advanced Analytics is a term often used for Predictive and Prescriptive Analytics. Using the built-in capabilities for statistical analysis and modeling available, we are able to quickly extend and incorporate custom calculations.